> Will the RC version of the Audi S1 rallycross car be faster than the real thing? 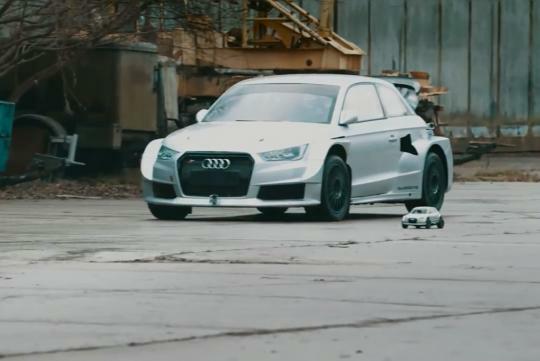 Will the RC version of the Audi S1 rallycross car be faster than the real thing? Team EKS pitches its 600bhp Audi S1 EKS RX Concept rallycross weapon against a scaled down version of the same car. Driven by Mattias Ekstrom who will be piloting the Audi in the 2014 FIA World Rallycross Championship, it gets its power via a 2.0-litre turbocharged engine. The century sprint is dispatched in an eye-watering 1.9 seconds. So who will be the winner? Watch to find out!